Open the window and look out at the emerald-green East China Sea. Enjoy the moment of relaxation as you breathe in the scent of the ocean and the pleasant sea breeze. Beyond the green grass lie white sand and the emerald-green sea with the white clouds floating in the blue sky. 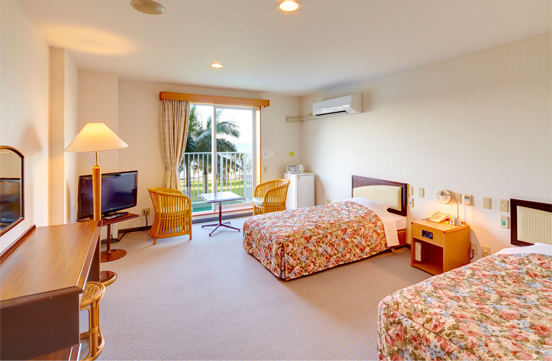 「Miyuki Hamabaru Resort」is filled with the charms of Okinawa, and is a phenomenal resort space. Enjoy the finest beach activities and relax in the beauty of the great nature. Sense the Ryukyu culture created by gentle, caring hearts. All of these wishes will be granted. Onna Village, the resort area located in the center of Okinawa, has an abundance of tour facilities, such as diving spots and golf courses. 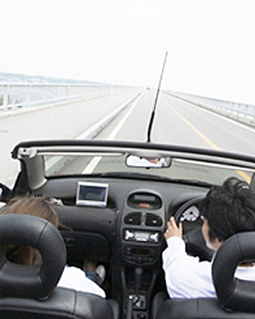 The Express Way, a convenient way to access the northern and southern parts of the island, is located nearby. 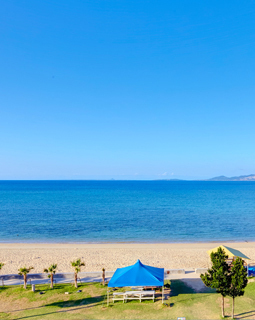 Gaze at the East China Sea from all of our ocean view rooms. Unwind while ing the scent of the ocean and the pleasant sea breeze. During the Sunset, enjoy the scenery change as time passes by. Sea Kayaking, Banana Boat, Marine Jets, etc. there are a plentiful variety in our line-up. Enjoy our Marine Activities to the fullest. Feel free to walk around the entire facility in the Yukata, including the restaurant. 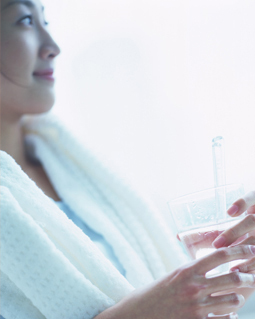 Feel as if you were at a “Ryokan” and further relax during your stay. Open the window that overlooks the emerald-green East China Sea, relax as you take in the scent of the ocean and the pleasant sea breeze. Enjoy the panoramic view of the vast ocean. In the mixed Japanese/Western Style Room, sit and stretch your legs on the tatami and it is perfect for families with elderly members and children. 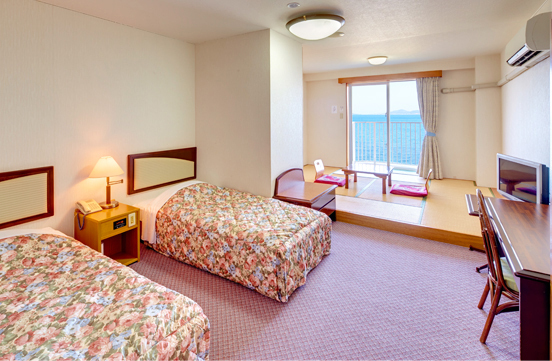 The Barrier-Free Rooms are located near the Front Desk. The room is so spacious, a wheel chair can move around in it. Safety was the top priority when designing the bathrooms and toilets. Spend your time here comfortably. In the summer time, Barbeque is the most popular! Enjoy spending dinner time with family and friends. The menu consists of Japanese and Western Style Buffet. Guests who do not have the breakfast package may also enjoy the restaurant, please feel free to ask any of our staff. Not only is there diving and snorkelling, but also there is an abundance of activities, such as Sea Kayaking and Marine Jet. With “Safety First” as our motto, we will provide all of our guests’ needs. 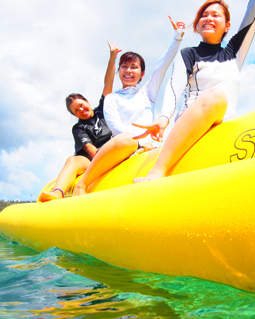 You can count on us to make your vacation in Okinawa a memorable one! Just bring your swim suit and towel! Facilities are complete! Restrooms and warm showers! Parking is also free. A variety of deck chairs and floats to rent! Feel free to ask any of our beach house staff. They will always greet you with a refreshing smile!